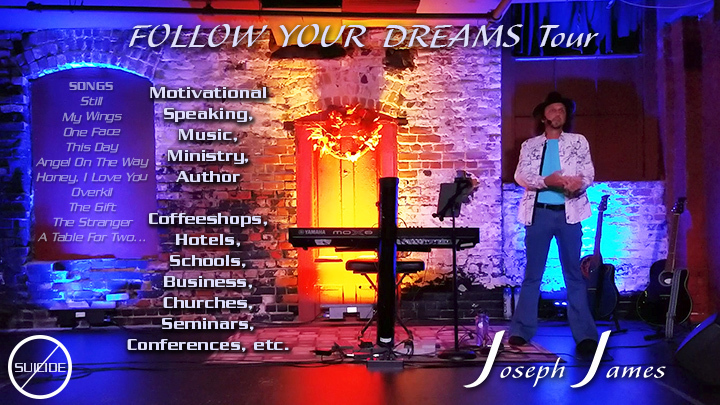 FREE EVENT | Joseph James, author and singer/songwriter, is coming to Denver to discuss what he is doing on his Follow Your Dreams tour as they’ve traveled the nation and Alaska over the last 5.5 years. They’ve reached out to communities and individuals, sharing hope and encouragement through meetings, concerts, and shows in order to help those going through depression and/or struggling with suicidal thoughts or just life in general. Seating Limited – Visit Event Link and Reserve Your Spot. They are locating to the Colorado Springs/Denver area to establish a hub for their tour outreaches and shows. COS is #2 and Denver is #8 in the nation in suicide. He’ll be sharing from he and his wife’s personal journey as well as what they’ve encountered in their journey with others. He’ll also be sharing some of his songs, so if you have a favorite, let him know. Some of his music is on YouTube and Streaming. His books are listed on the website below as well. He has published his wife’s biography and is in the process of filming the movie in San Antonio, Texas, Summer 2019. This meeting is for the purpose to reach out into the community to those who are interested in connecting to develop a plan of action together for this area, to combat the rate of suicide and to help redirect folks to searching for and discovering their dreams again. The Lord has a dream and plan for each of us, sometimes we just need a little bit of help from our fellow neighbors to get there. Storms are temporary and they pass, the sun comes out again, but suicide is permanent. Joseph and his wife are both ordained ministers and work with fellowships and other organizations in each community to see that each individual gets the help they want. Join us from 3-5pm. You can get there 30 minutes earlier and stay for 30 minutes later if you like. Seating is limited so please go to the event link above to reserve your place. Check out the tour and ministry websites below for more info, or send an fb message for more info. Limited seating to 40, so please let us know if you plan to attend. If you are interested in booking a venue and/or setting up a meeting in your area, please let us know. Together, we can make a difference and bring hope to the hopeless. Repost this event on your fb page, email to others and help us spread the word. We don’t always know who needs help, or who would like to help.